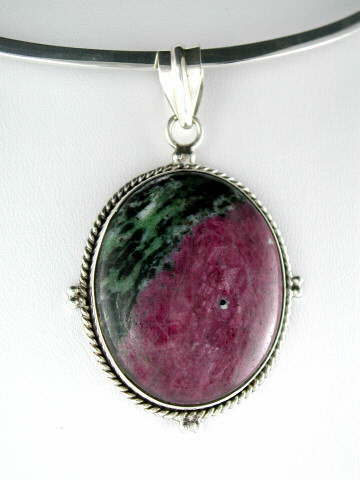 Beautifully balanced Ruby in Zoisite pendant set in 925 sterling silver. Also known as Anyolite, this formation aids physical vitality and is good for the recovering patient. A very dynamic stone, it can energise the whole energy field. Amplifies all psychic abilities and is said to attract money to the wearer. It is excellent for accessing past life memories giving the user the ability to identify karma brought through to this life, and therefore the lessons needed to learn.